Meet visitors from throughout the world. Demonstrate traditional Native American skills, or perform old fiddle tunes in the pioneer camp. Teach young students about the unique plants that grow in the Great Basin. Volunteer staff serve as front line representatives of the Trail Center. Welcoming visitors and providing basic information is a vital part of Trail Center operations. Information desk volunteers have the opportunity to meet and assist visitors from around the world. It isn’t necessary to be an expert on the California Trail or history. All that’s required is a love of people, good communication skills, and a warm smile. 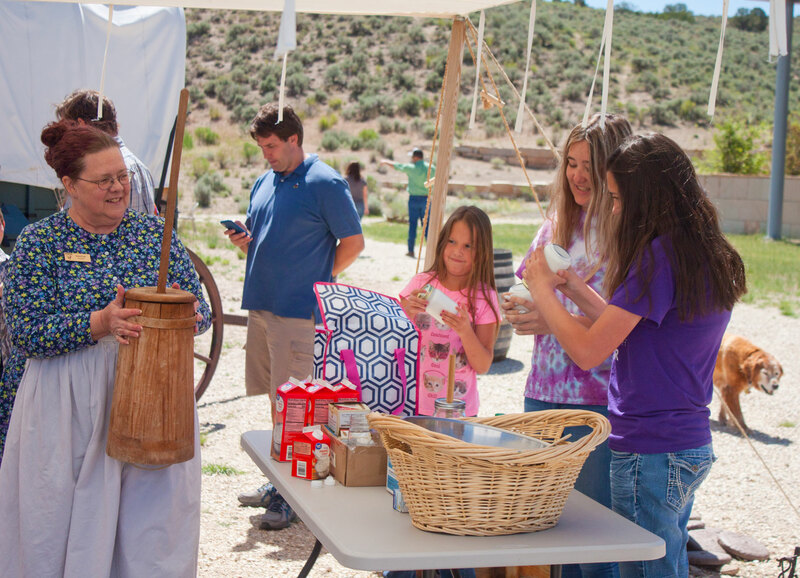 The California Trail Center seeks volunteers to demonstrate traditional Great Basin Indian lifeways, both indoors and outdoors. Examples include Indian beadwork, traditional Native foods, and basket making. The Trail Center also seeks volunteers to share their unique pioneer or mountain man skill. Just a few examples include: Operating a spinning wheel, performing traditional music in the pioneer camp, or cooking fresh biscuits over a campfire. During California Trail Days, reenactors have the opportunity to interact with hundreds of visitors in the span of one weekend. Reenactors provide visitors with an authentic experience of life on the trail. Encouraging visitors to see, touch, smell, hear, and taste history greatly enriches their experience. The education program at the Trail Center is wide and varied. Some volunteer educators teach students about pioneers and the California Trail. Others utilize our 40 acre site to focus on outdoor environmental education programs, and teach students about Great Basin biology and geology. Volunteers greet visitors, monitor trails and exhibits, help children play with traditional toys and games, provide demonstrations and much more. In 2019, California Trail Days takes place May 18th thru 19th. Volunteers bring history to life at the Center’s outdoor wagon encampment while wearing pioneer clothing. The opportunities are endless, from Dutch oven cooking to performing pioneer tunes on a fiddle. Demonstrations may also take place in the Trail Center lobby. Examples include, but are not limited to: spinning, weaving, quilting, doll making and gunsmithing. Volunteers conduct research on the California Trail and its impact to Nevada and U.S. history. An example: Volunteers research emigrant journals and diaries along with other first hand accounts of the pioneer experience. For more information about volunteer opportunities at the California Trail Interpretive Center, please contact Park Ranger Greg Feathers at (775)738-1849.